The hotel Majestic Elegance Punta Cana has 597 rooms distributed in two different sections are Elegance Club and Majestic Elegance. Each section has 4 different room categories. 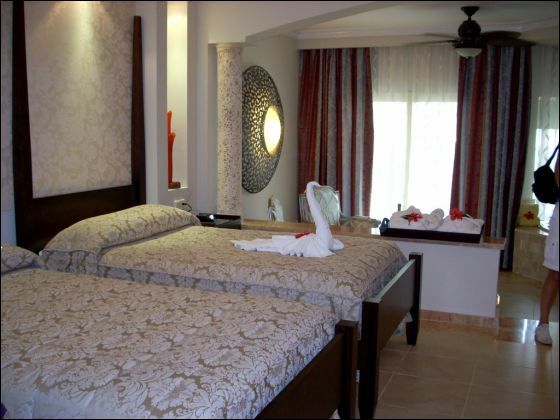 -All rooms at the Majestic Elegance Punta Cana are furnished with novel materials and with all the facilities you would expect in a tropical 5 star resort. European marble, king size four posted bed, complete bathroom, Jacuzzi , independent walk in shower with three functions: (Rain, massage and soft), independent room service door, Modern Plasma TV, audio system, independent air conditioning control, ceiling fan, satellite TV, DVD, telephone,hi-speed internet connection ( $ ), mini bar, safety deposit box, coffee machine, working desk, iron and ironing board and a nice terrace. Connecting room and handicap rooms are available only on the Jr. Suite Standard category at the Majestic Elegance Section. All rooms at the Majestic Elegance are furnished with novel materials and with all the facilities you would expect in a tropical 5 star resort. European marble, king size four posted bed, complete bathroom, Jacuzzi , independent walk in shower with three functions: (Rain, massage and soft), independent room service door, Modern Plasma TV, audio system, independent air conditioning control, ceiling fan, satellite TV, DVD, telephone, hi-speed internet connection ( $ ), mini bar, safety deposit box, coffee machine, working desk, iron and ironing board and a nice terrace. Connecting and handicap rooms are available. 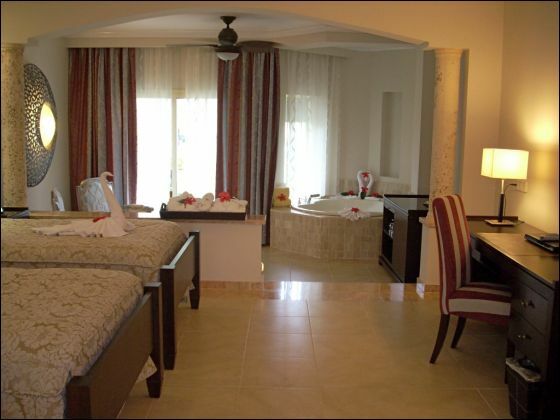 -The Hotel Allow 4 people on the standard rooms but maximum 2 adults and 2 children under 12 years old. Not 4 adults. Not 3 adults and 1 children, or any other combination. The Majestic Elegance Club is located in Two beautiful ocean front buildings with a total of 127 rooms in 4 different categories: Jr. Suite, Majestic Jr. Suite, Swim up Suite, and Ocean front suite. 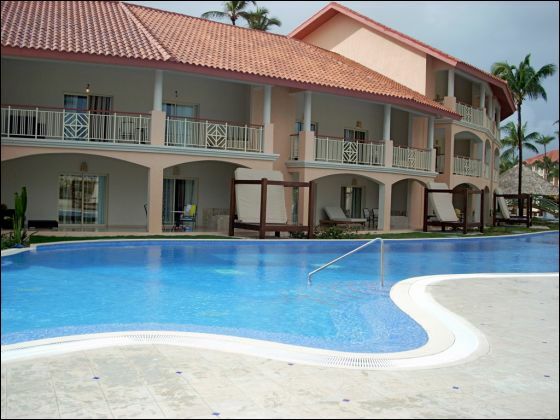 Each building has its own private swimming pool, and a private beach area. Private lounge bars and Private VIP area for check in and check out. The Majestic Elegance Club is adults only, Minimum age being, 18 years old. No exceptions allowed to this rule. 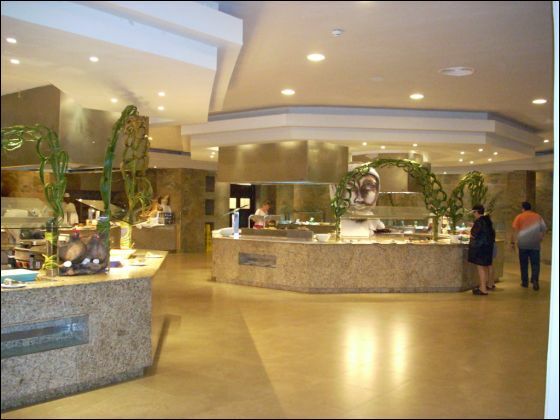 - Flavours: Our main buffet restaurant offers a select variety of international dishes and show cooking areas. Open for breakfast, lunch and dinner. Restaurant is air conditioned. Dress code applies. 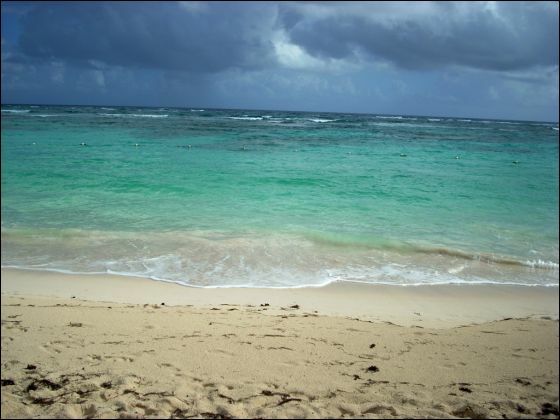 - See & Sea: Beach front restaurant with impressive sea views, fresh fish and see food specialties. - 9 Doors: Oriental restaurant offering 9 Teppan-yaki and two Sushi bars. Dress code applies. - "Asadito" -Steak House Restaurant. : Steak House Argentinean Style. With the best imported steaks and cuts from the US and Argentina. - Limited Gourmand: Gourmet International Cuisine, live pianist on site. Dress code applies. Adults only restaurant. - Il Botaccio: Italian restaurant. Dress code applies. Dress Code information related for all à la carte restaurants inside Majestic Resorts : long pants, poloshirt, shirts & closed shoes, thanks for your cooperation. The restaurant will remain open for Breakfast and Lunch, exclusively for guests staying at the Ocean front Beach (Adults only sections), Dress code applies. 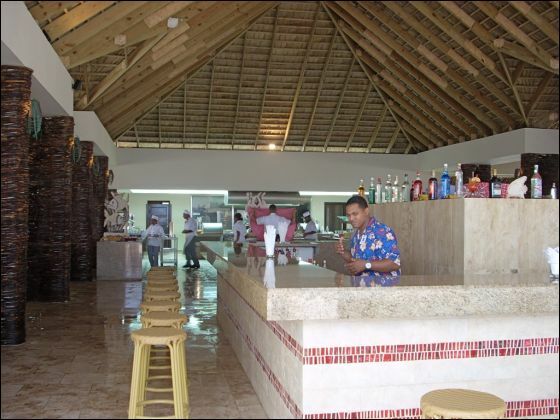 There are several bars for all guests at the resort, open in different areas and hours during the day. The flights: No problems - thanks for putting couples together, and the group close. Transfers: From airport in Punta Cana to airport and back - pretty seamless in our car - think there was a problem in the other car with luggage. Service: Bar, beach, and poolside service was very good. People were very nice and accomadating. We had a pretty big snafu with our luggage when we arrived. It was not very well organized, and it took us many hours to retrieve. Rooms: Loved having a balcony with an ocean view. Bed was comfortable - bedding was worn. Bathroom and shower were fine and kept clean. Asked for additional bath towels, but never received. Got wash cloths only twice. Would you return: Probably not - but only because there are so many places to see. How did you find our service? Great job, even with such a big group. Just wanted to tell you how much we enjoyed this resort and working with you in planning our corporate retreat! I know we had many of questions and your responses were sent ALWAYS timely and with great patience. With having 60 people traveling, all had questions and concerns and you made us all feel like we were your only clients. That really does say alot for a travel agency! One and all had a wonderful time! We did excursions together which was fun. Some didn't want to leave the beautiful beach and didn't go. Can't blame them. We've dealt with other agencies in the past and have never received such wonderful service before! Next year, we probably will choose a different destination but are sticking with you for our travel company! Frank and I just returned from the Majestic Elegance. We critique resorts based only on other resorts in the same destination (21 times in this area). First impression is terrific, beautiful lobby, great pools, and beautiful grounds. Huge room with many small problems, minifridge did not work (replaced), in room whirlpool did not work (did get it fixed - service for both minor complaints was fast-one call and in less than 10 minutes, they were there to fix the issues), some broken lights, wires, vents and light fixtures hanging from ceiling, paint drops on decor, etc. Buffet food was average at best, buffet area had ambiance of a high school cafeteria. At least 2 of the 4 ala cartes were closed every night. Food compared to similarly rated resorts was less than expected. Everyone said try the steak house, but it was closed most of the time. 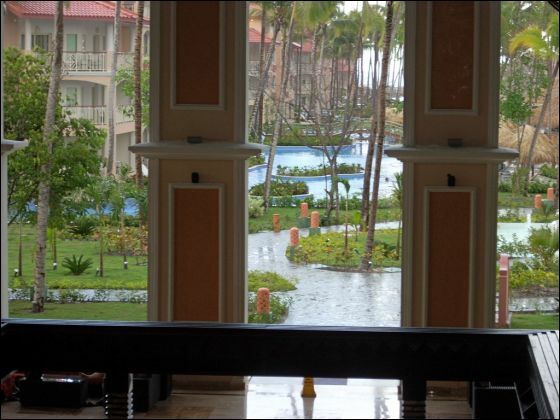 Resort maintenance not great, many missing pool tiles, lights in stairwells out, fountains quite dirty, etc. Staff however was great, beach in this area is very nice, as with all resorts in this area. Hello! I had a great time and I thank you all for booking this trip for me! Transfers: Driver was there waiting as soon as we arrived in Punta Cana, also driver came on time to the hotel to pick us up and bring us to the airport. Service: The service at the hotel was great, all employees looked at me and said hi as I walked by them thoughout the resort. Rooms: This was the nicest room I have ever stayed in! Entertainment: There were shows every other night I believe, I attended the Michael Jackson show which was by far the best show impersonation Michael Jackson that I've ever seen. Would you recommend this resort? Yes! This resort is great for couples! Thanks again for helping us plan such a nice, relaxing trip! You've always done a great job! We are looking forward to our trip you helped us plan for Aruba in the Fall! We will continue telling all of our friends and family about your wonderful service! Thank you so much for your help! You all have helped us plan some of the most memorable and amazing vacations! This is another to remember! Pool: *5* We didn't spend any time in the pools, but they looked very pretty. Service: *4* Front desk people were not always very helpful. I think part of the problem was that the hotel was at full capacity. Some of the wait staff at the buffet and the restaurants were the friendliest people I have ever met at any resort. A lot of staff adored our son and gave him a lot of attention. Food: *4* The buffet was good, especially at breakfast, while the restaurant were okay. During breakfast, they made fresh smoothies, crepes, etc. However, Royal Playa Del Carmen had way better food at the restaurants. On the other hand, my parent really liked the food, so I guess Boris and I are kind of spoiled. Rooms: *5* The rooms were very nice. Our only complaint was that we really wanted a king size bed, but got a room with 2 double beds. Our first room was right near the theater where they have evening shows that go from 10pm - 11 pm, and Boris had to put a lot of pressure on the front desk for us to switch the room to a more quiet location. Our room was on the forth floor, facing hte Colonial resort, it would have been much nicer to be facing the pool, on a top floor. Entertainment: *4* I didn't see anything going on at the beach other than volleyball. But I am sure there was something going on by the pool. They also had dance, yoga, spanish, etc lessons, but we never went. We didn't see any of the 10 pm shows b/c we had to put our son to sleep. But they did have a terrace where they had a live band play until 10 pm which was very good. Would you return: Definitely. Absolutely loved the beach, the food was good enough, the room was very nice, and we never had any stomach problems. They had professional photographers on the resort from Argentina, and we had a session with Ligia. The pics she made for us are the pictures that we own, period. Absolutely love them. Would you recommend this resort? Yes! This resort just seemed like it was suitable for all - from families to couples! As always you all did an excellent job! Already have recommended your services and will continue to do so! We are already trying to figure out when we can return! Next time, we plan on going with our friends and their family! We will be calling you as soon as we can figure out our travel dates! 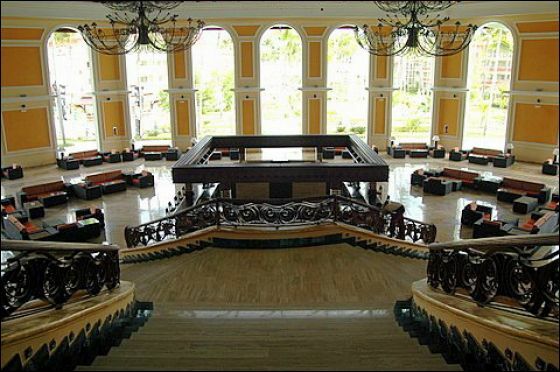 Just wanted to share information on our recent stay (April 1-7, 2009) at the Majestic Elegance! 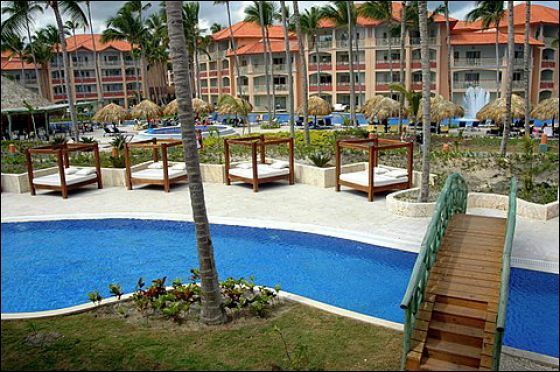 The MAJESTIC ELEGANCE is located about 35 minutes from the PUNTA CANA airport ~ also next to the Gran Bahia Principe resort. So not bad - transfers were great! This resort is a real winner! This is a high-end resort with a definite WOW factor! We loved everything from the service level to the luxurious accommodations. We stayed in the ADULTS ONLY ELEGANCE CLUB WOW! Each building has its own private swimming pool, and a private beach area. Private lounge bars and Private VIP area for check in and check out. The Majestic Elegance Club is adults only, which we thoroughly enjoyed. This is a very nice resort indeed and it’s literally next door to the Majestic Colonial. (The two resorts share the children’s center and casino). 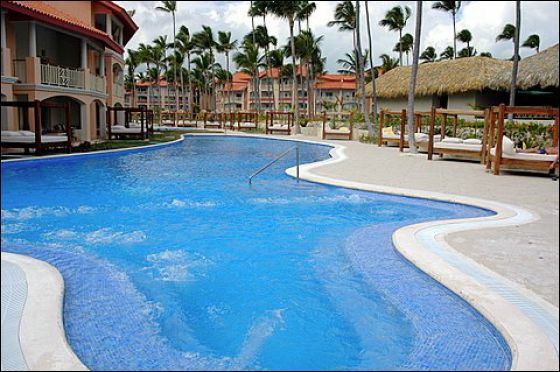 We have stayed at numerous other resorts in Punta Cana and this by far is one of our favorites! Definitely will return and we will be calling you to set that up! You all made this a breeze to book! Your information has been right on and very much appreciated. We have already referred our friends your way - they too can't say enough about your service! Once Again - THANK YOU!